If you choose a Musketeer as your pirate class, the first person you meet on your way out of the stockade will be Wing Chun. Like you he was captured by the Armada and locked in the brig below decks. When you first meet Wing Chun he is a Crane Student. You can learn much more about his abilities and skills from Pirate101 Central. As you level up your companions they will occasionally reach epic promotion opportunities. Wing Chun’s first epic promotion occurs when he is promoted to Level 13. After you applied training points and he reaches this level, he’ll tell you he needs to speak with you in the nearest Tavern. 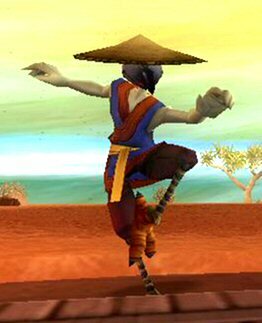 He’ll explain that even though we are far from MooShu, there is a legend of an Iron Monkey, a Monquistan who became a Monk and Master of Mooshu. Then Wing Chun suggests asking the Prior at Saint Bonobo’s Abby about this Iron Monkey. Travel to Monquista and head to St. Bonobo’s Abby. Prior Andreo will tell you the story of the Iron Monkey. You learn of Brother Matteo, a legend who was blessed by the Holy Tree of Monquista. He journeyed all the way to MooShu spreading the Monquuistan faith. But he returned a changed Monkey. He renounced his vows and became a Monk for some Sacred Cow in a far off land. We can only assume this is the Moodah. At this time he took a new name: Iron Monkey. When the Monquisition came for him, he defeated three dozen of their soldiers with his bare hands. He fled into the Vortex of Torment and never came out! And evidently they never went in after him. The Vortex of Torment isn’t far from the Stormgate to Skull Island. There’s nothing to fight here, you can easily enter the vortex and dock at the Iron Sanctum. The Sanctum is a small island with a Mooshu styled Pagoda resting on the far side. Under the Pagoda you will find the Iron Monkey. At first he will think you are messenger from Subata. Wing Chun tells him he is a humble student who has come to be tested by the Master. The Iron Monkey responds and sends you on a quest back to the Tradewinds Skyway. 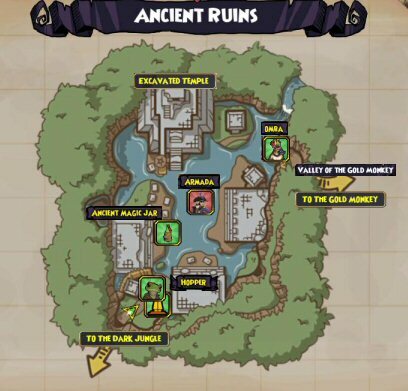 Return to the Gold Mine and gather bananas in the Ancient Ruins. You’ll be able to find all you need right around Hopper. You might also see a quest that needs to be fulfilled at the Gold Mine docks. The quest involves slaying Storm Sharks and Flying Fish. You might as well complete the quest because it’s worth a companion training point. You’re already here after all. 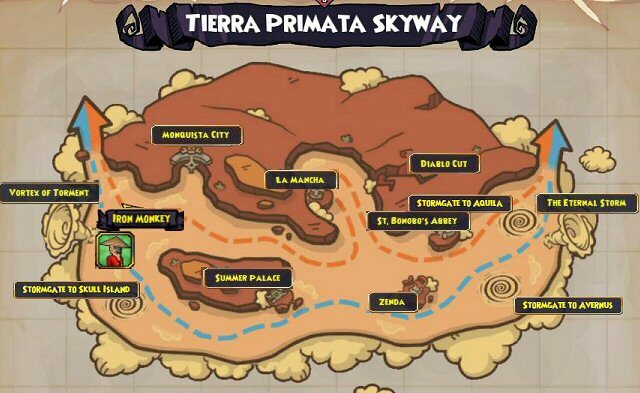 So take on the fishes pick up the training point and head back to Monquista. When you return to the Vortex of Torment and hand over the bananas, the Iron Monkey will thank you and explain he’ll eat them later. For now, it’s time for Wing Chun to prove himself and be tested in battle! As his Captain you and your companion will fight the Master together. He’s fast and packs a powerful punch. When I faced him with my Wing Chun, my pet joined in the battle, which was helpful. If you plan carefully during the battle, you’ll be able to defeat the Master without loosing too much of your health. Simply make sure you start this battle with your life filled to the brim and you’ll be fine. Once defeated the Master will promote Wing Chun to a Crane Disciple. Wing Chun is not as humble as Kan Po is modest in the acceptance of his Disciple title. Wing Chun responds “Indeed! Come, Captain, let us go to a Tavern, and celebrate!” With the testing done he suggests a trip to the nearest Tavern to celebrate. The nearest Tavern will be back at the St. Bonobo’s Abby. So head on over there where Wing Chun will tell you “It is done! My journey continues. If you keep listening to me, Captain, perhaps even you can find enlightenment!” Hmm..not even a thank you for the assistance? How wude! You can still raise a mug of Yum to the new Crane Disciple. As you complete the quest, he’ll level up. 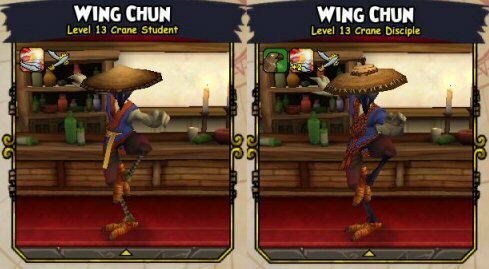 Wing Chun’s next promotion will come when he reaches level 47. At this level he will take the opportunity to become a Crane Master through the South Wind Rising quest. My Wing Chun has just leveled up to the Disciple, so he has a bit farther to go before he reaches this next quest level. But as soon as he does, I’ll update his Quest page.